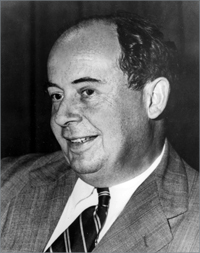 John von Neumann was Commissioner of the United States Atomic Energy Commission (1955-1957). Other institutional affiliations included the Institute for Advanced Study. His research interests included mathematical logic, set theory, theory of continuous groups, ergodic theory, quantum theory, operator theory, high speed computing devices. December 28, 1903Birth, Budapest (Hungary). 1921 – 1923Attended University of Berlin, Berlin (Germany). 1925Obtained ECh, Eidgenössische Technische Hochschule, Zurich (Switzerland). 1926Obtained PhD, University of Budapest, Budapest (Hungary). 1926Rockefeller Fellow, University of Göttingen. 1927 – 1929Privatdozent, University of Berlin. 1930 – 1931Lecturer, Princeton University. 1931 – 1957Visiting Professor of Mathematical Physics (1931-1933); Permanent Member and Research Professor (1933-1957); and Director, Electronic Computer Project (1945-1957), Institute for Advanced Study. 1937Member, National Academy of Sciences. 1940 – 1957Member, Scientific Advisory Committee, Ballistics Research Laboratory, Aberdeen Proving Ground, United States Army. 1941 – 1955Consultant, Bureau of Ordnance, United States Navy. 1943 – 1955Consultant, Los Alamos Laboratory. 1947 – 1955Consultant, Naval Ordnance Laboratory, United States Navy. 1949 – 1953Member, Research and Development Board, United States Department of Defense. 1949 – 1954Consultant, Oak Ridge National Laboratory. 1950 – 1955Consultant, Armed Forces Special Weapons Project. 1950 – 1955Consultant, Weapons Systems Evaluation Group, United States Department of Defense. 1950 – 1957Member, Board of Advisors, University of the Andes. 1951 – 1953President, American Mathematical Society. 1951 – 1957Member, Scientific Advisory Board, United States Air Force. 1952 – 1954Member, General Advisory Committee, United States Atomic Energy Commission. 1953 – 1957Member, Technical Advisory Board on Atomic Energy, United States Department of Defense. 1954 – 1957Chair, Advisory Committee on Guided Missiles, United States Department of Defense. 1955 – 1957Commissioner, United States Atomic Energy Commission. 1956Awarded Enrico Fermi Award, United States Atomic Energy Commission. February 2, 1957Death, Washington (D.C.). First Wife. Married 1930 to 1937. Second Wife. Married in 1938. Post-doc advised by Von Neumann at the Institute for Advanced Study. Advised by Von Neumann at Princeton University. Attended from 1921-1923 and Privatdozent. Visiting Professor of Mathematical Physics; Permanent Member and Research Professor; and Director, Electronic Computer Project. Commissioner; Member, General Advisory Committee; and received 1956 Enrico Fermi Award. Member, Scientific Advisory Committee, Ballistics Research Laboratory. Member, Research and Development Board; Consultant, Weapons Systems Evaluation Group; Member, Technical Advisory Board on Atomic Energy; and Chair, Advisory Committee on Guided Missiles. Abraham Taub's notes on the John von Neumann quantum electrodynamics lectures, 1933. John Von Neumann collection, 1913-1925, 1942-1956, 1989-1992. John Von Neumann papers, 1919-1966 (bulk 1919-1949). Institute for Advanced Study electronic computer project drawings, 1949-1961. Lewis L. Strauss papers, 1914-1974. M. H. A. Newman papers, 1916-1984. Oral history interview with Athelstan Frederick Spilhaus, 1989 November 10. Oral history interview with Banesh Hoffmann, 1984 October 13. Oral history interview with Charles L. Critchfield, 1987 May 29. Oral history interview with Eugene Paul Wigner, 1987 May 12. Oral history interview with Franz L. Alt, 1969 February 24 and March 13. Oral history interview with Herbert F. York, 2008 April 24. Oral history interview with Herman Heine Goldstine, 1977 March 14. Oral history interview with John E. Naugle, 1980 August 20. Oral history interview with Martin Schwarzchild, 1986 Nov. 18. Oral history interview with Martin Schwarzschild, 1977 March 10, June 3, December 16 and 1979 July 19. Oral history interview with Robert Sproull, 1983 July 11. Oral history interview with Rolf William Landauer, 1984 October 17. Oral history interview with Thomas F. Malone, 2000 November 12. Oral history interview with Valentine Bargmann, 1984 April 12. Oral history interview with Walter H. Munk, 1986 June 30. The Princeton years and beyond, 1930-1940: Invited paper for the March 1992 meeting of the American Physical Society, 1992. Twenty-four minutes to checkmate, [unpublished manuscript] 1953-1957. John von Neumann collected works. General editor, A. H. Taub. Mathematical foundations of quantum mechanics. Translated from the German ed. by Robert T. Beyer. Theory of games and economic behavior / by John von Neumann and Oskar Morgenstern. John von Neumann / Norman Macrae. John Von Neumann and Norbert Wiener : from mathematics to the technologies of life and death / Steve J. Heims. John von Neumann and the foundations of quantum physics / edited by Miklós Rédei, Michael Stöltzner. John von Neumann and the origins of modern computing / William Aspray. John von Neumann as seen by his brother / by Nicholas A. Vonneuman. John von Neumann Physics Today obituary. John von Neumann, 1903-1957 / edited by J.C. Oxtoby, B.J. Pettis, G.B. Price. The Martians of Science : five physicists who changed the twentieth century / István Hargittai. Turing's cathedral : the origins of the digital universe / George Dyson.